Mary Elise Leary, daughter of St. Charles Parish District Judge Lauren Lemmon and Dan Leary, was named most valuable player on Louise S. McGehee School’s varsity softball team. She was also selected to the 11-3A All-District softball team by the district coaches. Leary, a sophomore, batted .380, scored 17 runs and stole 16 bases. She struck out only once in 58 at-bats. Leary is finishing her sophomore year at Louise S. McGehee School. 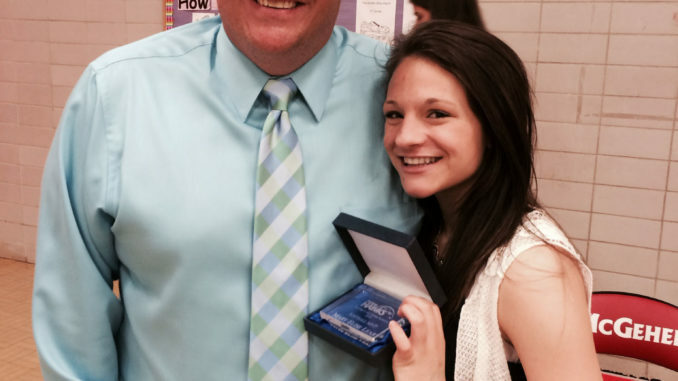 She is pictured with Louise S. McGehee head softball coach Scott Western and is holding her MVP award.